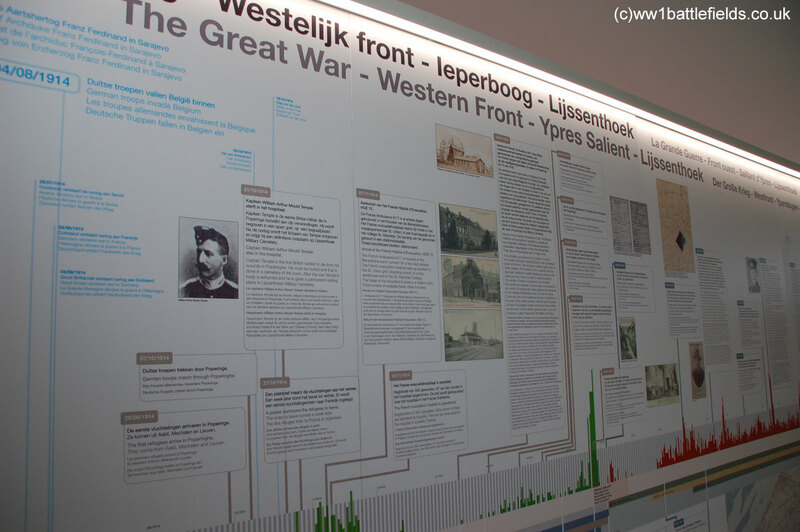 Lijssenthoek Military Cemetery is located two miles south-west of Poperinghe, which itself is about 7 miles west of Ypres. 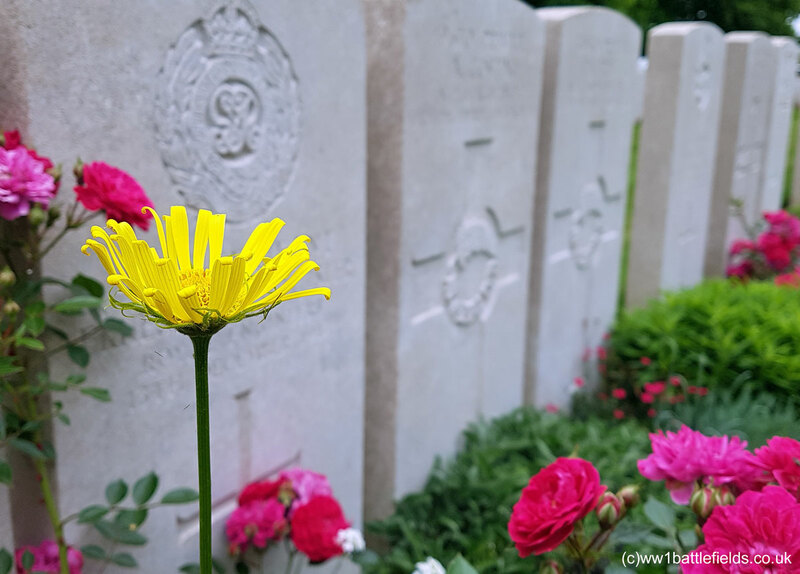 The cemetery is is the second largest Commonwealth War Cemetery in Belgium (the largest is Tyne Cot) with 10,785 burials – 9,901 of which are Commonwealth soldiers, the remainder mainly French and German. It is reached by following the N38 south from the ring-road around Poperinghe, and is well sign-posted off to the left. During the war, this location was also known as Remy Sidings, and was the location for a number of Casualty Clearing Stations. Farm buildings stood just north-west of the cemetery, known as Corfu Farm during the war. A railway line ran not far away, and today the N38 you probably followed to reach the cemetery runs along the same route that the railway lines ran during the war. The dates 1914-1920 are inscribed above the imposing main entrance way which has large cast iron gates set within it. 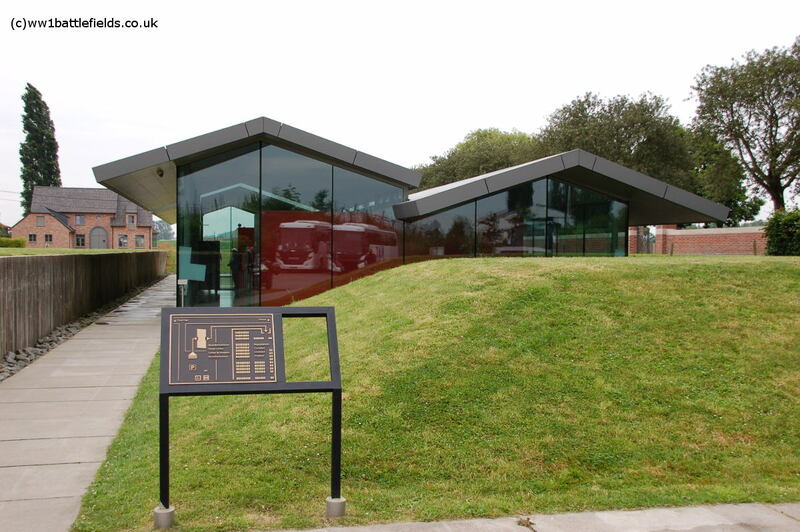 The car park is located to the right of the cemetery, and next to this is a fairly new visitors centre. There are also toilets in a separate building at the rear of the car park. Entering the visitors centre first, there are displays about the history of the cemetery and the location before the war. The displays include numerous old photos and maps. There is also a timeline with a graph showing the numbers of burials each day. A large red spike in 1917 shows the large numbers associated with the 3rd Battle of Ypres (Passchendaele). In the middle are video displays including past/present comparisons. There are “listening walls” enclosing this display area, whilst at the other end of the building is a wall with photos, a screen showing information on those buried here and also a seating area. Leaving the visitors centre a path leads into the cemetery itself. Lijssenthoek is a very large cemetery, although it is very hard to convey this with photographs due to the many trees which break up the view. There are French graves just inside the main entrance to the left, and German graves at the front right, but most of the French and German graves are located towards the rear of the cemetery. There is also a small plot of Chinese graves. 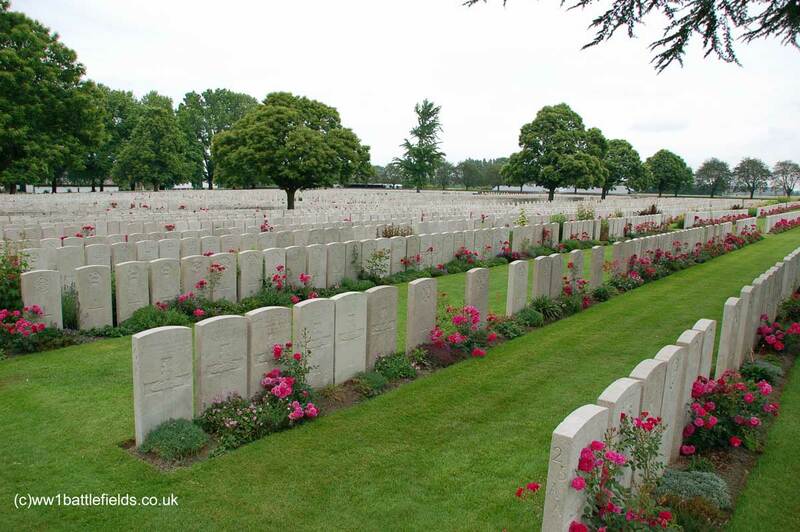 The cemetery was originally started by the French 15th Hopital d’Evacuation, and used by British forces from June 1915. Just to left of the Stone of Remembrance, Plot 32 consists of two rows of headstone set in semi-circles; one short and one long. Those in the front row are in fact special memorials to men known to be buried here but the location of whose graves is now not known. Interestingly, there are two graves of American soldiers set near one another but apart from the other burials. These are the graves of James Pigue of Tennessee, a Lieutenant in the 117th Infantry who died on July the 18th 1918, and also Larry King from New York. 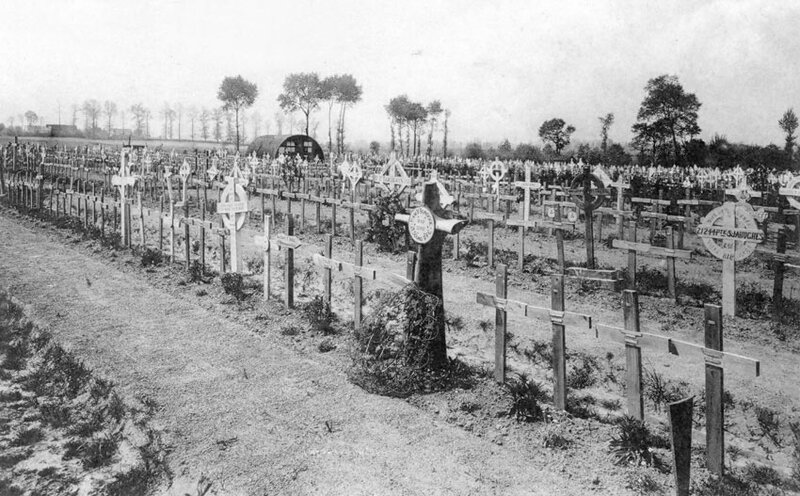 The photograph below, from a postcard, shows Lijssenthoek cemetery shortly after the war, when the original crosses were still in place. Several names are clearly visible on this, allowing the location to be determined – it shows Plot 14. A modern photo shows the same view today. The cross marking the grave of Victor Bundock shows he was a 1st Air Mechanic with 21 Squadron, although the CWGC entry lists him as Airman 1st Class. He was aged 23 when he died on the 27th of June 1917. Victor Bundock was born and brought up in Southend-on-Sea, the son of a Draper’s Assistant. Visible in the row behind is a cross to Driver R Hargreaves. The register shows that this is the grave of Rowland Hargreaves who served with the E.E. Cable Section of the Royal Engineers, attached to the 1st Anzac Corps. This Section would have laid signal cables, often from horse-drawn cable carts. Hargreaves was from Leeds and was a tailor’s runner and just 21 years old and 5′ 6″ tall when he enlisted in December 1914. After training he was based for a while in Alexandria, and arrived in France in April 1916. The Nissan hut visible in this old picture is more or less where the large tree near the Stone of Remembrance now stands. There are a number of senior officers buried here, contrary to the myth that the Generals in the Great War kept safe and sound out of harms way. One such man is Brigadier-General Alister Gordon, who commanded the 153rd Infantry Brigade, and was a veteran of the Ashanti Campaign of 1901 and the South African War. He died of wounds on the 31st of July 1917 aged 45. On that day, the 153rd Brigade, part of the 51st Highland Division, attacked at 3.50 a.m. south-east of Langemarck on the first day of Third Ypres. 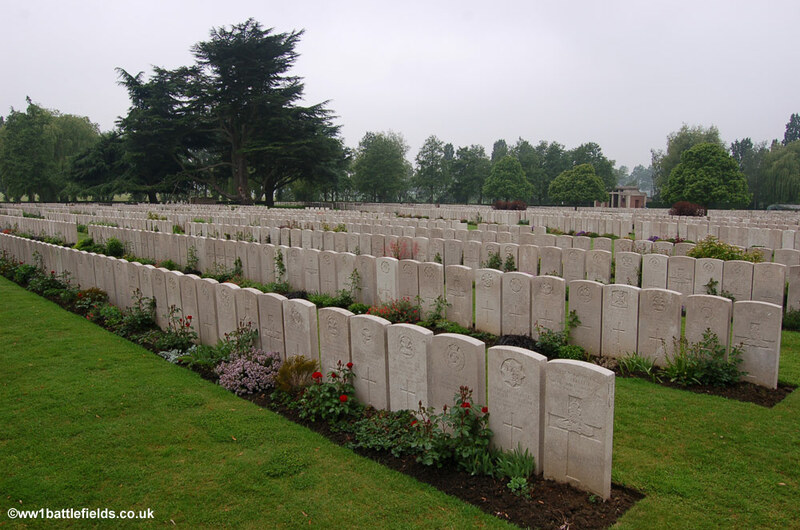 Amongst the thousands of men buried here is one woman – Staff Nurse Nellie Spindler of the Queen Alexandra’s Imperial Military Nursing Service. From Wakefield, she was with the 44th Casualty Clearing Station then based near Brandhoek when she died on the 21st of August 1917, aged 26. That day, the Germans shelled the area around the 44th CCS at around 10 a.m., critically wounding Nellie, who was in bed at the time and who died within a few minutes. 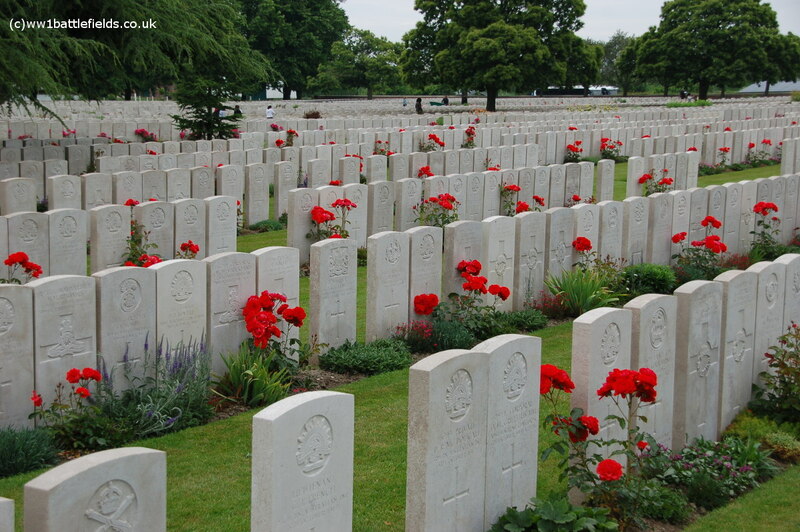 The CCS moved that same day to Lijssenthoek, and Nellie was buried here with full military honours and with the Last Post played over her grave. She was officially described as ‘killed in action’ by the War Office, and had only been on the Western Front since May 1917. 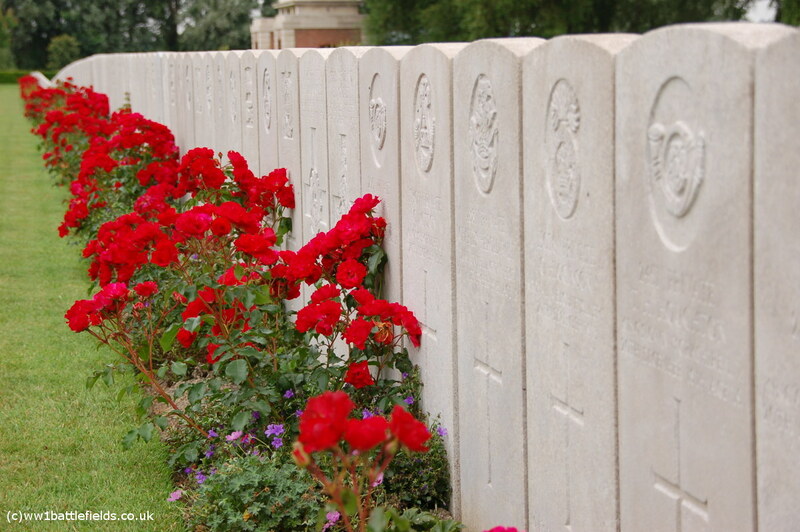 According to the CWGC records she is one of only two female Great War casualties who are buried in Belgium. The other is Mabel Gladstone, also a nurse with the Queen Alexandra’s Imperial Military Nursing Service, who is buried at Belgrade Cemetery near Namur. An Australian soldier buried here, Private John Donald Sutherland, known as ‘Don’ had enlisted on the outbreak of War in August 1914. He had certainly seen his share of action by 1917, having been hospitalised with gun shot wounds in Gallipolli and Malta in 1915 and admitted sick to hospital in France in 1916. He suffered gun-shot wounds and a fracture of his right leg on the 3rd of October 1917, before dying from these wounds at the 3rd Canadian Casualty Clearing Station the next day. In April 1918 the Casualty Clearing Stations were withdrawn as the Germans launched their great offensive, but Field Ambulances were located here instead.